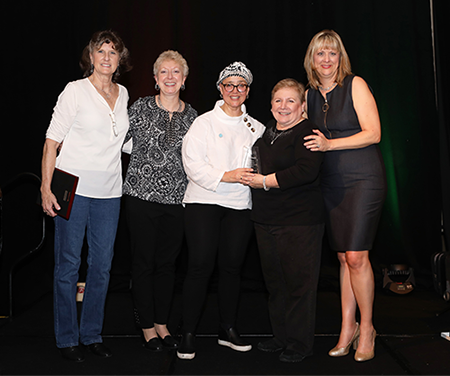 CRANBURY, New Jersey, January 30, 2019 — At the Ninth Annual Navigation & Survivorship Conference in Dallas, Texas, on Saturday, November 17, 2018, the Academy of Oncology Nurse & Patient Navigators (AONN+), the premier national organization for navigation professionals, presented the 2018 CONQUER: the patient voice Hero of Hope Patient Award to Jessica Morris, whose two-year experience with brain cancer led her to create OurBrainBank, a nonprofit organization in support of people with glioblastoma. Ms. Morris, who calls herself a “natural born campaigner,” founded OurBrainBank after she was diagnosed with glioblastoma in January 2016. She found that it was a way to channel her energy and drive, while tackling her illness – what she described as the “biggest challenge I’ve ever faced.” Ms. Morris subsequently launched the OurBrainBank app to help patients with glioblastoma and their caregivers deal with the disease. The OurBrainBank smartphone app is free, and it allows patients to track and manage their symptoms digitally and to share these data with cancer researchers. The app also helps to connect patients with prospective clinical trials. After the presentation of the awards, Ms. Morris stated that she was “happy to accept this incredibly prestigious award” not just for herself “but for everyone with glioblastoma,” and for everyone who has helped her during her treatment and with her effort to start OurBrainBank. The award, she said, was a sign of the recognition OurBrainBank was receiving for “valuing the patient experience.” She added that the award will bring much needed attention to glioblastoma. 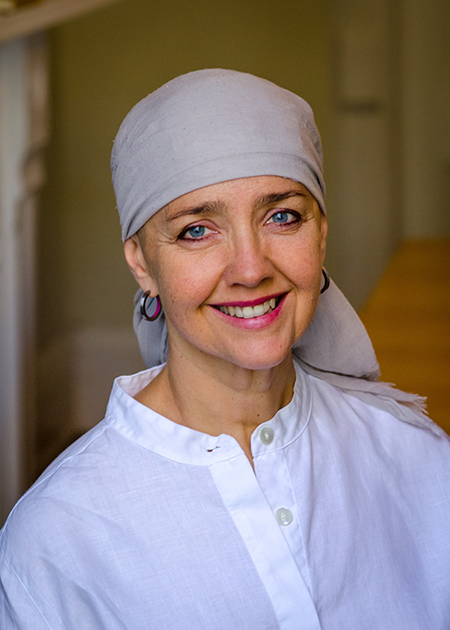 Speaking to the relative shortage of funding for uncommon cancers, such as glioblastoma and pancreatic cancer, Ms. Morris noted that although these cancers are relatively rare, they are “incredibly complex, incredibly aggressive.” She believes that research that helps to find a cure for glioblastoma may have a far-reaching impact on treatments for other forms of cancer as well. Glioblastoma, also known as glioblastoma multiforme, is the most common form of adult primary brain tumors and the most aggressive, with an average survival of approximately 14 months. Glioblastomas represent about 15% of all primary brain tumors and are slightly more common in men. Treatments may slow the progression of the cancer and reduce its signs and symptoms, but there is no cure. Ms. Morris shares the diagnosis of glioblastoma with the late US Senators John McCain and Ted Kennedy, both of whom died from this disease, as did Beau Biden, son of former Vice President Joe Biden and Jill Biden, EdD. 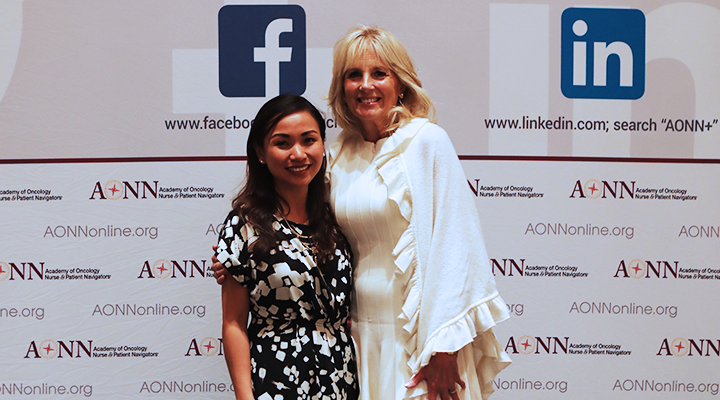 Dr. Biden is also a co-founder of the Biden Cancer Initiative, and she delivered the keynote speech at the 2018 AONN+ Annual Conference. The AONN+ Awards are given annually and honor individuals and organizations for excellence in the field of oncology navigation in a variety of categories that touch all aspects of the care spectrum. The awards are presented during the Saturday evening gala. The Hero of Hope Patient Award is selected by readers of CONQUER: the patient voice. For more information, including how to become a member of AONN+, please visit our website at https://www.aonnonline.org. The Academy of Oncology Nurse & Patient Navigators (AONN+) is the largest national specialty organization dedicated to improving patient care and quality of life by defining, enhancing, and promoting the role of oncology nurse and patient navigators. The organization, which has more than 8,200 members, was founded in 2009 to provide a network for all professionals involved and interested in patient navigation and survivorship care services in order to better manage the complexities of the cancer treatment process. CONQUER: the patient voice magazine® is the Academy of Oncology Nurse & Patient Navigators (AONN+) premier forum for patients with cancer. CONQUER features articles written by and for patients with cancer, survivors, nurse navigators, and other oncology team members. This magazine addresses the issues that patients, their family members, and caregivers face every day in an easy-to-read format. Issues include interviews with patients with cancer, information on access to care, and articles on lifestyle topics such as nutrition, stress management, personal finance, and legal and employer issues.